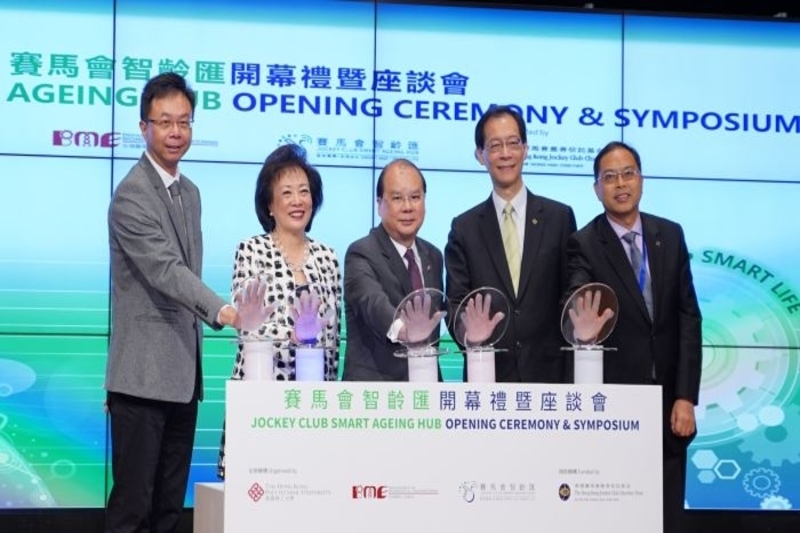 According to a recent press release, The Hong Kong Polytechnic University (PolyU) officially launched the Jockey Club Smart Ageing Hub (the Project) today to support the elderly to enjoy “Smart Age・Smart Life”. The Project receives the generous support of HK$47.95 million from The Hong Kong Jockey Club Charities Trust, as it is a nominated project under the Chief Executive’s Community List. The five-year project aims to promote the application of gerontechnology for enhancing the quality of life of the elderly. In addition to the officiating guests, PolyU also invited academics, experts and industry leaders for elderly service from Hong Kong and around the world to attend a symposium held immediately after the opening ceremony of the Project to discuss leveraging innovative technology to cope with the severe challenges arising from an ageing population. The symposium saw experts from the United States, Canada, Korea, Singapore, Taiwan, and Hong Kong introduce the development of smart living in their countries or regions and shared different approaches in applying technology for building an inclusive community that can cope with the diverse needs of the elderly. Addressing the ceremony, a PolyU professor stated that the Jockey Club Smart Ageing Hub, operated by the Department of Biomedical Engineering (BME) of PolyU, will capitalise on the University’s professional knowledge in wide spectrum including medical technology, rehabilitation, nursing, etc. to facilitate sectoral collaborations and to promotegerontechnology products and services for enhancing the living quality of the elderly, noting that more than research efforts, however, will be needed to make the Project successful. The Project strives to build an interdisciplinary network that supports smart ageing initiatives. Through showcasing cutting-edge gerontechnologies and related products from around the world, the Project aims to raise public awareness about the benefits of applying innovative technology in elderly services. The Project will also serve as a platform to facilitate stakeholders such as academics, healthcare professionals, elderly care service providers, technology developers, and caregivers for the elderly, etc. to develop innovative and quality technology products that best fit for the elderly. The Project will help advance PolyU’s endeavour to encourage future generations to innovate technologies and solutions that can cope with the rapidly changing needs of an ageing population. PolyU students, especially BME students, can test their innovative ideas for elderly care through this Project and participate in the Project’s service-learning to gain experience of serving the elderly and understand their needs. PolyU has set up the “Day Experience Centre” on the campus for this Project to showcase gerontechnology products and demonstrate their features in enhancing the elderly’s quality of life. The 10 categories of products on display cover different aspects of the elderly’s life: dress and groom, kitchen and dining, home and living, mobility, personal hygiene, safety device, health management, etc. The Centre has also built a model smart home for elderly, which was modelled on the exact scale of a typical housing unit and equipped with gerontechnology devices in its living room, kitchen, bathroom, and bedroom. Innovative technologies for elderly healthcare pioneered by the BME of PolyU will also be showcased in the Centre. A typical example is the eNightLog system, which is an effective device to monitor the elderly who have dementia symptoms. Others include iHome, iWheelchair, iBalanx, Rehab Sleeve, etc. which are designed for enhancing safety, mobility and rehabilitation for the elderly at their home. The Centre will be open to the public for exploration activities, workshops or guided tours. It will also serve as an experiment field for students of various disciplines who take the course of “Technologies for Smart Ageing” offered by BME to test their technological solutions. PolyU will also collaborate with six non-governmental organisations to set up “Real-life Hostels”. The BME team will provide smart assistive devices that match the environment and needs of the nursing homes designated by the participating organisations. One of the smart devices to be installed in these nursing homes is the eNightLog system, which can help enhance the work efficiency of the frontline caregivers and the safety of the elderly residents. Elderly care service providers from other organisations are welcome to visit these “Real-life Hostels” to understand the practical uses of gerontechnology. The aim is to encourage the industry to widely apply innovative technologies in elderly care services through these services.